I help families feel empowered during their transition to parenthood through unbiased support. 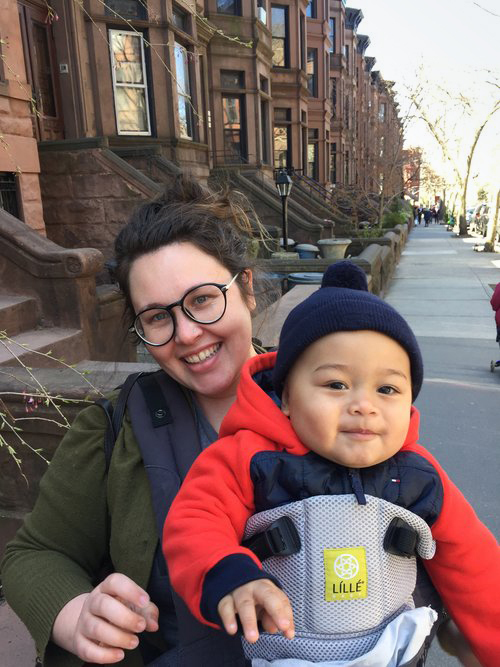 Alison provides inclusive, non-judgmental support to pregnant people of all pregnancy choices, experiences, and outcomes in the New York City area. I am experienced with pregnancy and birth to provide you with support that is unique to your experiences, your family, and your needs. My aim is to help you have a positive and satisfying birth experience as you define it. I’m going to be honest, I didn’t have a doula for my birth. I never expected to be a mother and was overwhelmed with information and decisions to be made. My midwives encouraged me to get a doula, advising me that it didn’t matter how much experience they had but rather if I felt comfortable with them. But as I scrolled through endless profiles and websites, I didn’t feel represented in my attitudes toward birth and came away not really sure what a doula did. Why couldn’t I navigate my own birth by myself with my partner at my side? Was it really that hard? And then my water broke early and finding a doula went out the window. Emerging out of the baby fog, I saw how the lack of support during pregnancy and postpartum periods made my experience stressful and how I wasn’t being honest with myself about my mental health. I wondered what other people’s birth journeys were really like − not that sugar coated version you get when you’re pregnant because they don’t want to “scare” you. So I began to read everything I could get my hands on − from history to personal experiences and everything in between − finding narratives that resembled my own and ones that didn’t. The common thread of empowering birth stories was the feeling of being affirmed, attuned to, and cared for when embarking on this life-changing transition. In this modern world, we rarely have ancestral knowledge of birth and transition to parenthood to pass down so doulas have taken up this role to reassure and comfort during this journey. And I realized that even though I didn’t have a doula, I felt strongly that pregnant people should be supported how they wanted and aspired to be a doula. I want birth to feel known and less scary; I want doctors to respect us as we give birth; and I want my son to be supported if he decides to make the journey into parenthood. Originally from the Midwest, I received my BS in Graphic Design from the University of Cincinnati and I moved to Brooklyn after college. I live with my partner and son in Bedford-Stuyvesant where I co-founded and lead a community garden where I can get my nails dirty and hang out with neighbors.